If you have a standard drip-style coffee maker, a Keurig or another trusted coffee-making device, then you may wonder why you’d need a coffee percolator? There are really a number of reasons why these devices are worth looking into! For example, some simply find that they prefer the taste of coffee made with a percolator to other styles. Others may find these devices to be particularly helpful for camping. No matter what your reason is, it’s worth learning more about some of the top percolator options! 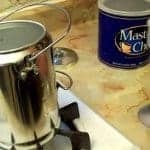 Read on to get helpful information that can assist in your percolator shopping. 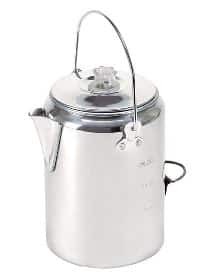 This Percolator is a fantastic option for those who want something with a lot of versatility. It’s fantastic for both outdoor and indoor use, meaning whether you’re in a hotel or campsite, you’ll be good to go. 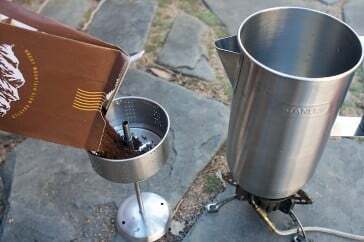 Furthermore, the GSI percolator is a lower cost option, so you won’t need to worry about breaking the bank to try out percolator-style coffee. With an ability to hold about 8 cups, it’s a great option for the whole family or those who have a serious coffee addiction. Additionally, this option comes in the classic enamel camping style that many are familiar with and enjoy. You’ll get the percolator, in either blue or red, as well as the insert for your grounds. Customers find that it’s also highly durable, so you’ll be able to use it in a variety of heating locations! Furthermore, it’s one of the most inexpensive models you can buy! If this percolator interests you, feel free to check it out and get a closer look! For those with larger families, or who just like to drink a lot of coffee, the Hamilton Beach 40616 is a fantastic choice. It’s able to hold 12 cups, so you’ll be unlikely to run out too quickly! Furthermore, this is an electric option with a detachable cord so it’s easy to use and simple to store. The handle is also designed to stay perfectly cool, even while anything inside the percolator is simmering. 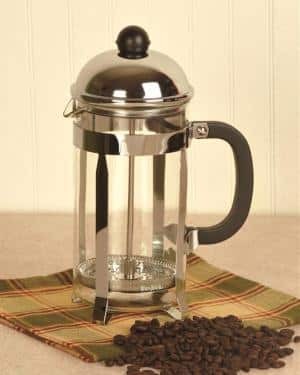 This percolator comes in well under $50 and is also made with a permanent filter, so you won’t need to worry about buying ones to use. To keep the coffee at the ideal temperature, this device also makes use of a heater so you won’t need to worry about the brewed coffee sitting for too long. Overall, this is a great option for indoor use that many have come to enjoy! If you’re looking for a highly durable option that can be used indoors or outdoors, it’s hard to go wrong with the Stansport Percolator! 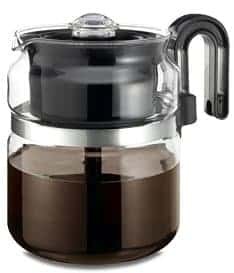 This percolator comes at a low cost and is available in both 9 and 20 cup styles, so you’ll be able to get exactly the amount you need even if you’re brewing for a large number of people. It’s made of aluminum, is available for almost nothing and is made to be rustproof so you won’t have to worry about rust making it into your cup. For those who are looking for something to use around a campfire, this option is made with a taller handle to help you grab the device without being burned. 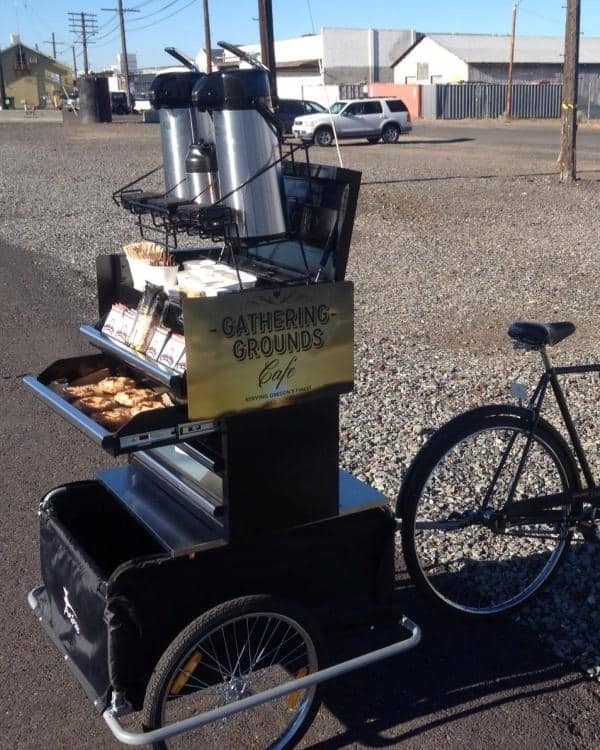 The basket for grounds is included, so you won’t need to buy one unless you want a backup. Customers have especially enjoyed how handy this tool is while camping, as it can easily be used over a campfire. If you’re not looking for something to use on a campfire and only need to make coffee for yourself then the FCP240 percolator is worth a look! It’s a small, compact device that is able to brew quickly using a power of 1000 watts. For each cup of water, you can expect the FCP240 to take about a minute to get it brewing! This electric device is simple and easy to use and comes in 4 cup, 8 cup and 12 cup sizes depending on the amount you need to make. Furthermore, there’s also a “keep warm” mode for your coffee to stay fresh and hot in between cups. The handle is also made to stay cool and offer enough space to pour easily and comfortably. Many customers find this to be a reliable, long-lasting percolator that they can enjoy for many years. Feel free to take a look if this device interests you! For those who are just looking for something to use on their stove top, the Medelco Percolator is a great, low cost option. As opposed to many other options, this one is made from mostly glass, giving it a unique appearance. You’ll also be able to see just what’s going on inside of the percolator while it brews. 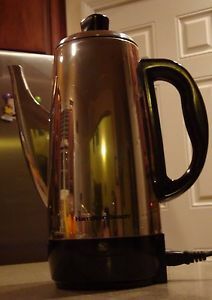 This percolator is able to make 8 cups, which is a decent amount for smaller groups. 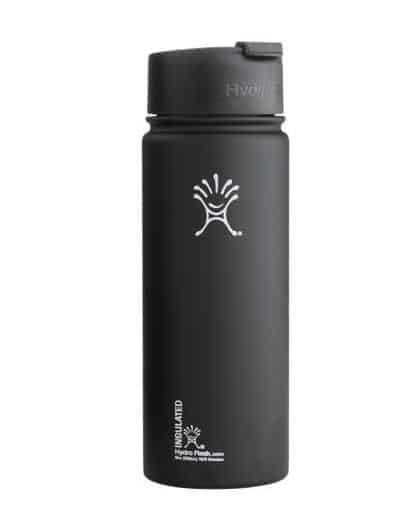 In addition, the unique handle and spout are made to make pouring easy and avoid dripping. You’ll also get a specialized trivet for use on electric range coils. Futhermore, this percolator is made to be resistant to stains and easily washed in your dishwasher. Customers have given the Medelco a lot of praise for the delicious results and user-friendly design. 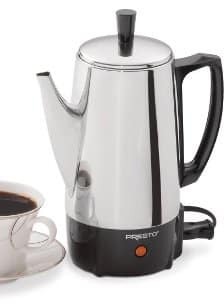 Another fantastic electric percolator option is the Presto 02822. It’s a 500-watt device that is able to brew 6 or 12 cups depending on the size you purchase. Furthermore, this device works by using the heat to send the water up through the grounds. There’s also a “ready” light that will indicate when the coffee has brewed thoroughly and ready to be served. To keep the coffee from getting cold in between cups, there’s also an automatic-warm mode. Unlike some other options, this percolator is tall rather than wide. Because of that, it will take up less counter space for those who value compact devices. For added convenience, the cord is also detachable to make it easy for storing while not in use. 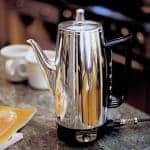 Many who have used this percolator have found it to be a simple, durable option that has lasted them for many satisfying years. It’s also one of the cheapest options. With a stylish, unique look the Coletti percolator is really going to stand out wherever you use it. It can be used in a number of ways, including on grills, around the campfire or on a stove! In addition, you’ll be able to get 9 cups out of this device for around $35, which is enough for quite a few people to enjoy. This percolator is also designed to be very durable, so you won’t need to worry about it breaking due to the heat around it. Because of this design, it’s a fantastic device to take with you on camping trips when you need something that can handle the heat of a campfire. Some also find that this percolator allows them more control over the coffee-brewing process than drip-style coffee makers. 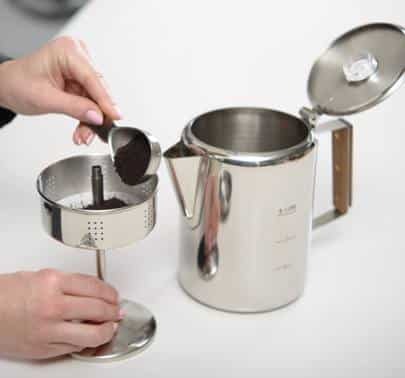 Customers love the simple, easy-to-use design that makes this percolator truly great for a variety of uses. 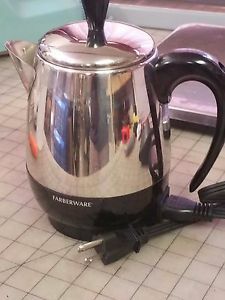 One of the top percolator choices available today is the Farberware Yosemite. 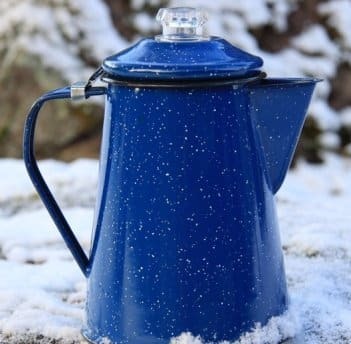 It’s a simple, stainless steel percolator that can work on your stove or in the great outdoors. In addition, you can get both 8 cup and 12 cup sizes to ensure your needs are met. The 8-cup model can also be found under $30. This heavy-duty device also includes a filter basket, so you won’t need to worry about buying other filters. The inside of the Yosemite is also made to be non-reactive so you won’t need to worry about the water inside absorbing any add odors or flavors. Furthermore, it’s completely dishwasher safe, making it easy to clean when you’re finished using it. Many have found that they are able to get richer coffee flavor using this device than they may achieve with other kinds of coffee makers. The Yosemite is truly a perfect device for those looking to step away from more technically-minded coffee makers, whether it’s for indoor everyday use or out in the wilderness. Customers praise the durability and ease of use provided to them by the Yosemite percolator. Conclusion: Which Perc is Better? A coffee percolator can be a great device to use for a number of reasons. Some like them for camping while others like the electric versions for their simplicity. 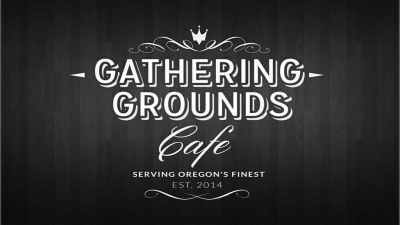 They can also offer a greater flavor to your resulting coffee than you may not get from other coffee makers. No matter which style you try, you’ll surely find a highly useful tool that can last you for many years. 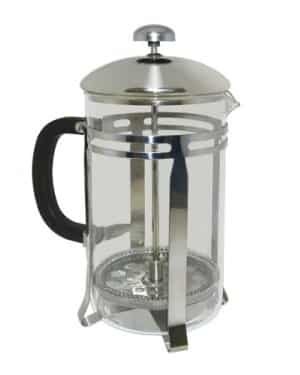 If you are looking for a particular style of percolators we have dedicated space here on the site to break them down by style. This page features our absolute favorite stovetop percolators. These work best in a home kitchen on either natural gas or electric stoves. If you have an induction stovetop then pay close attention to the material the perc is made from. 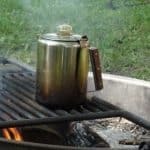 If you are going camping specifically I would take a dedicated percolator to make my coffee. In this post we review nine of the best percs for the outdoors. I wouldn’t usually use these for my normal coffee making activities in the home but over an open fire I would use any of them in a heartbeat! 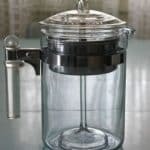 Stovetop percolators made from glass are truly a vintage style. You can find glass percolators going back for generations and although metal versions are more durable there are still manufacturers making them from glass even today. Unlike metals which can tarnish, impart metallic flavors, or minerals into your coffee glass is beautiful and makes coffee taste it’s purest. Here are some good glass percolators that you can easily buy today, brand spankin’ new. 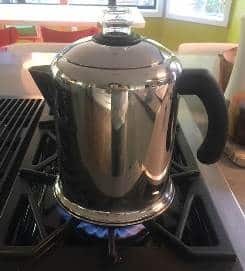 If you’re looking for the perfect percolator for you, take your time to consider when, where and how you’re going to need to use it.